"This is not a hotel. This is not a mountain hut. This is something better. This is the friendliest place you'll stay in Switzerland." We are very fortunate to receive many fantasic reviews, which have resulted in us winning the Trip Advisor Travellers choice award for 2013, 2014, 2015, 2016 and 2017. We are also rated by Airbnb as "Superhosts". It is true, we aren't a hotel, or a mountain hut, we aren't a purpose built B&B or a restaurant with rooms to let ............. this is our home into which we welcome you. A tradition that was first recorded in Kandersteg in 1658 as travellers rested in private homes before their trip across the Alps via the Gemmi Pass. Below are detailed descriptions of the accommodation that we offer you today and photos of each room. Every room is unique and has its own special features. The Hayloft group/family room is a thoughtful conversion of the original two-storey part of the house that was literally used to store the hay feed for the over-wintering of animals. It has been lovingly restored using original timber and converted, it is now comfortable open plan accommodation for six persons, split on two levels. An external access door ensures privacy from the main house. It has a superb view of the Allmenalp waterfall. A cot fits easily into this room. Dogs are welcome in this room by prior arrangement. 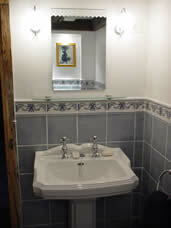 A shower room with washbasin, toilet, hairdryer and electric socket, has been integrated into the accommodation. There is also a table and chairs. Lavender is our pretty twin-bedded room. It has its own en-suite showeroom accessed via a small traditional staircase. The room is equipped with drawer space a large wardrobe and a small table with a comfy chair. A hairdryer is also provided. The twin room has stunning views across open farmland and up the valley to the snow capped Altels (3629m - 11,906 feet). 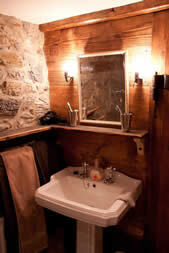 The en-suite "cellar" bathroom is accessed via a small internal staircase. Arnica is our most recently renovated room. 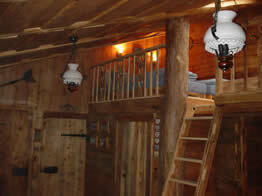 A three bedded room on the first floor of the house. Arnica looks onto the Allmenalp waterfall and across fields to the mountains. The room is equipped with a large chest of drawers ,a wardrobe and soft chair. The private showeroom is adjacent to the room. A hairdryer is also provided. The single room is very quaint but has limited headroom. It is ideal for the single traveller not wishing to pay a 'single occupancy supplement". It has a chest of drawers, small table and chair, hairdryer and hanging space. There are fantastic views across open pastures to the mountains beyond. The bathroom, with both shower and a freestanding bath is shared on the floor below. 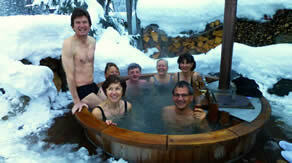 Can there be anything more relaxing after a hard day skiing or hiking than to return to warm, bubbly water? Spend a while relaxing and taking in the view, or maybe a romantic candle lit dip to watch the stars! There is a beautiful natural garden area with seating. You should be aware that this is a non-smoking home which extends to immediate areas around the house. Wireless internet access is available at no extra cost. There is mobile phone coverage on the property. This is a family run bed & breakfast where by prior arrangement at time of booking it is sometimes possible for you share evening meals with the family. Please ask when you book to avoid disappointment. There are no kitchen facilities available for use by our guests. This includes our fridge. Please do not bring your own kettle, food and drinks to prepare at The Hayloft. The house is over 500 years old and consequently the rooms are smaller than modern day houses. They are well equipped and decorated to be very cosy. The single, twin and triple rooms have low ceilings in places. Our check in time is from 4pm onwards and we ask you to vacate your room by 10am.